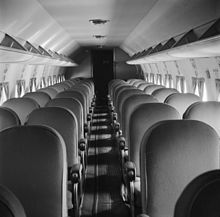 Following proving flights by United Airlines of the DC-4E it became obvious that the 52-seat airliner was too large to operate economically and the partner airlines[a] recommended a long list of changes required to the design. Douglas took the new requirement and produced a new design, the DC-4A, with a simpler unpressurised fuselage, R-2000 Twin Wasp engines and a single fin and rudder. With the entry of the United States into World War II, in June 1941 the War Department took over the provision orders for the airlines and allocated them to the United States Army Air Forces with the designation C-54 Skymaster. The first, a C-54, flew from Clover Field in Santa Monica, California on 14 February 1942. The DC-4/C-54 proved a popular and reliable type, 1945 being built between May 1942 and August 1947, including 79 postwar DC-4s. Several remain in service as of 2014. One current operator is Buffalo Airways of Yellowknife, Northwest Territories. 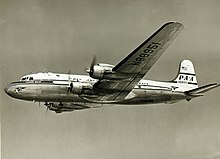 Purchasers of new-build DC-4s included Pan American Airways, National Airlines, Northwest Airlines and Western Airlines in the USA, and KLM Royal Dutch Air Lines, Scandinavian Airlines System, Iberia Airlines of Spain, Swissair, Air France, Sabena Belgian World Airlines, Cubana de Aviación, Avianca, Aerolíneas Argentinas, Aeropostal of Venezuela (1946) and South African Airways overseas. Several airlines used new-build DC-4s to start scheduled transatlantic flights between Latin America and Europe. Among the earliest were Aerolíneas Argentinas (1946), Aeropostal of Venezuela (1946), Iberia Airlines of Spain (1946), and Cubana de Aviación (1948). Basic prices for a new DC-4 in 1946-7 was around £140,000-£160,000. In 1960 used DC-4s were available for around £80,000. Very few DC-4s remain in service today. The last two passenger DC-4s operating worldwide are based in Johannesburg, South Africa. They fly with old South African Airways (SAA) colors. They are ZS-AUB "Outeniqua" and ZS-BMH "Lebombo" and are owned by the South African Airways Museum Society and operated by Skyclass Aviation, a company specializing in classic and VIP charters to exotic destinations in Africa. A 1944-built DC-4 is currently being restored in New South Wales, Australia. Buffalo Airways in Canada's Northwest Territories owns eleven DC-4s (former C-54s of various versions); four for hauling cargo and three for aerial firefighting. A 1945-built DC-4 (C-54E) c/n 27370 is currently operating as a flying museum of the Berlin Airlift. Called the "Spirit of Freedom", it has been touring the world for nearly 20 years. Alaska Air Fuel also operates two DC4s out of Palmer, Alaska. One ex-Buffalo DC4 (N55CW c/n 10673, currently registered to AIRCRAFT GUARANTY CORP TRUSTEE) is fitted with spray bars on top of the wings and is currently based in Florida on standby for oil pollution control. ^ a b "History: Products: DC-4/C-54 Skymaster Transport". Boeing. Retrieved 20 January 2015. ^ Stapleton, Rob (15 August 2009). "Brooks Fuel keeps Alaska supplied using legacy aircraft". Alaska Journal of Commerce. Retrieved 27 February 2017. ^ Berry 1967, pp. 70–73. ^ "de havilland | 1960 | 2687 | Flight Archive". Flight. 18 November 1960. Retrieved 28 February 2017. ^ Blewett 2007, p. 101. ^ ""Outeniqua" Douglas DC-4 1009 ZS-AUB c/n 42984". South African Airways Museum Society. Retrieved 21 January 2015. ^ ""Lebombo" Douglas DC-4 1009 ZS-BMH c/n 43157". South African Airways Museum Society. Retrieved 21 January 2015. ^ "Portfolios: SkyClassic". SkyClass Aviation. 31 March 2014. Retrieved 20 January 2015. ^ Morgan, Ben. "Engineering Underway on the Douglas DC4". hars.org.au. Archived from the original on 31 January 2012. Retrieved 21 September 2011. ^ "Buffalo Airways Aircraft Fleet". Retrieved 17 November 2015. ^ "Berlin Airlift Historical Foundation". Retrieved 11 February 2015. ^ "City: airport's future bright". ^ "Douglas DC-4 "Oil Bomber" Spray Plane at KCGI". seMissourian.com. Retrieved 9 February 2016. ^ "N55CW (1942 DOUGLAS C54D-DC owned by AIRCRAFT GUARANTY CORP TRUSTEE) Aircraft Registration ✈ FlightAware". Wikimedia Commons has media related to Douglas DC-4.